Good news for Guns N’ Roses fans who don’t want to go to Las Vegas for their reunion shows (although, if you’re a Guns N’ Roses fan, there’s a pretty good chance you’re into Vegas, too): This morning, the band sent out a press release teasing the American (and one Canadian) cities that are about to have a run on Jack Daniels and lacy ‘80s lingerie, because GN’R are coming to town. 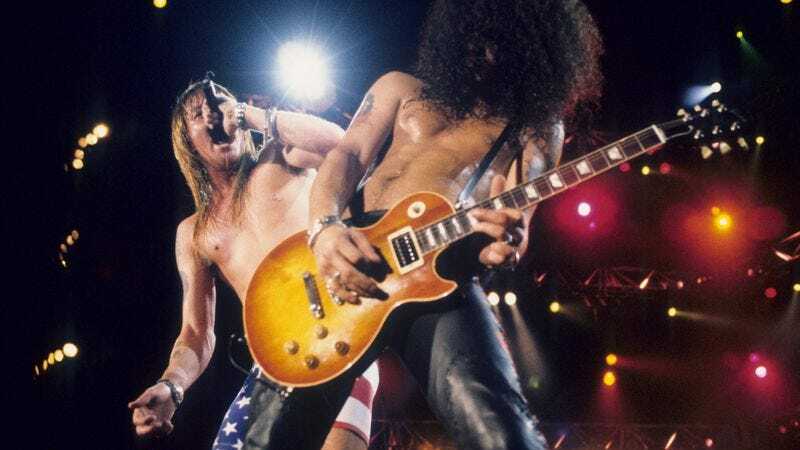 The news comes shortly after rumors began flying around that Axl Rose—who is definitely part of the reunited Guns N’ Roses lineup—would be filling in for AC/DC singer Brian Johnson for the remainder of their American tour. That particular theory is based solely on a morning radio DJ saying he saw Axl Rose walking around in Atlanta while AC/DC was in town for a show, though, so take that with a grain of salt (to chase your tequila shot). Then again, it was radio DJs who started the rumor that Guns N’ Roses were reuniting, and that turned out to be true, so we’ll see. The full list of cities is below.